"This list of countries ranges from China at number 1 with 420 million Internet users, and Denmark at number 50 with 4.75 million Internet users. We’ve included this ranking within parenthesis next to each country in the charts below for those who want to know." There are so many ways you can interpret the data provided by Akamai. 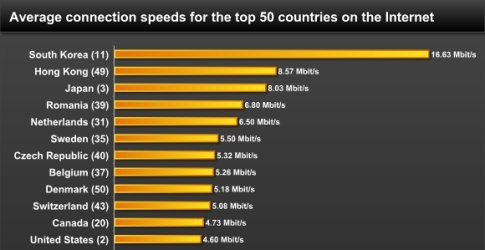 One thing that does surprise me is that every so often, you hear about how certain places like Japan or South Korea have access to extremely high speeds like 100Mbit/s or faster yet the country averages are far below those speeds. Even in my home country of Canada, where we are seeing ISPs offer well over 10Mbit/s, the average is well below at 4.73Mbit/s. The report does not say what the average contracted speed is compared to what was actually delivered, only speeds achieved, and you will note that some countries do have people using speeds under 256Kbit/s, probably something along the lines of dial-up connections! It can sometimes be easy to forget where we have been; I only vaguely remember the waits I had to endure with ISDN, let alone dial-up speeds. Fortunately, I seem to be sitting at about the average speed for my country, with my actual coming very close to my contracted speed. What about you? Do you subscribe to anything faster? Is it worth it? Do you find you often get the speeds you have paid for?